I always spend one day for sightseeing and exploring at any place. 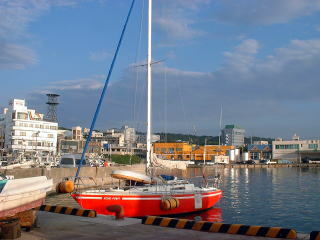 I had to leave Tanega-shima next morning. Then, this report had only limited information on the day of arrival. 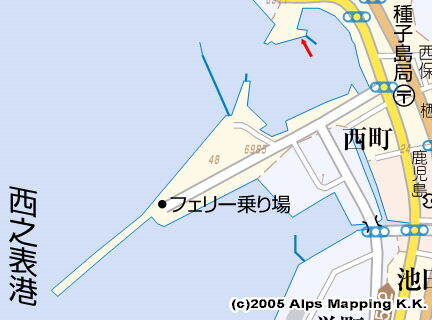 Nishino-omote has three ports: Old Port, New Port which is in the back of the ferry terminal, and the right side. I headed to Old Port, which I had heard the best was. A guy of the sightseeing information center said some yachts came to New Port, which is close to the downtown. I moored the boat there temporally and asked the fisheries cooperative if there was OK.
another berth space was at the right end of the west quay which had the ice machine. As people of the fishing boats were friendly and kind, I had a very good impression here on them. there is a varied-selection supermarket six minutes away. Toilet with western styles is in front of A-COOP. Coin laundry is next to A-COOP. A bathhouse is available for JPY 1500 at Hotel New Tanegashima, for JPY600 at Tanegashima Royal Hotel, far away. Water is available at a tap in front of the ice machine, a fisherman said. it served good enough dishes with reasonable prices.